Saint George's Park, one of the world's largest sporting facilities to use aerogel insulation technology, is the Football Association's National Football Center and the training ground for all 24 of England's teams. Designed to be the place to inspire world-class performance and become the international University of Football, it is a hub where sport and business can interact. Redboxdesign Group designed this dramatic multi-purpose facility to focus on coaching and education. The 134-hectare site includes a replica Wembley pitch, a full-size covered artificial pitch, sports hall, changing rooms, and a sports medicine and science centre. It also includes a five-star 142-bedroom Hilton Hotel and a three-star 86-bedroom Hampton by Hilton Hotel together with offices, conference, banqueting and training rooms as well as formal hard and soft landscaping. 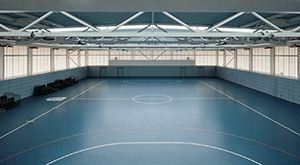 Of particular interest is the full-size indoor football pitch and the separate sports hall. These dramatic structures are side lit by using the Kalwall translucent cladding system, supplied by Stoakes Systems Ltd, to create perfect playing conditions, by evenly diffusing natural daylighting which eliminates glare and shadows. Importantly, the sports hall has also maximized the highest level of daylight insulation and energy efficiency by incorporating LUMIRA® aerogel within the 950 meter2 of Kalwall cladding installed around its perimeter. This performance is achieved by filling the panels with translucent LUMIRA aerogel to produce a remarkable 'U'-value of 0.28W/m2K, equivalent to a solid wall. Barry Farrar, managing director of Redboxdesign, says, "This was an interesting and very important project and one where we were keen to flood the main facilities with plenty of natural daylight. At the same time, we had to consider privacy and insulation, both of which are more than satisfied by our choice of Kalwall translucent cladding. However, in the multi-purpose sports hall, we needed to go one step further which is why we chose to upgrade the cladding by including LUMIRA aerogel within. Everyone is delighted with the diffused daylighting coupled with high insulation and energy-saving performance which will reduce running costs for years to come." David Sheepshanks, National Football Centre Board Chairman, comments, "In Wembley, we have a world-class stadium, and in Saint George's Park we have the place to inspire world-class performance."